In our fast-paced society, it can seem as if our lives are governed by time. 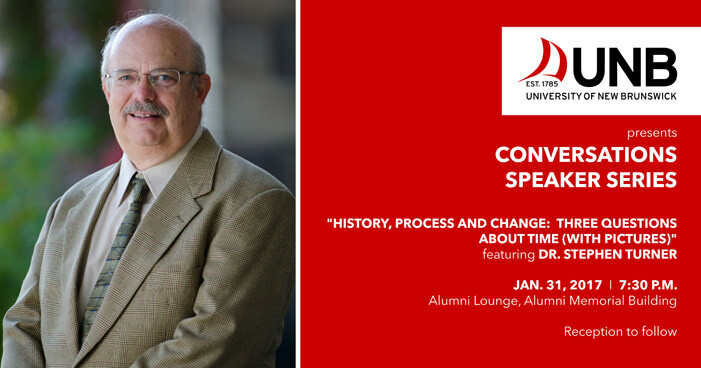 In the second installment of the University of New Brunswick’s Conversations on Time Speaker Series, Dr. Steven Turner, professor emeritus of history at UNB, will propose that time has a much deeper and profound effect on our society than just our daily schedules. During this interactive event, Dr. Turner will engage the audience with three questions about time: How have technologies, such as the mechanical clock, changed our perception of time? How has the discovery of deep time, such as geo-history, changed our awareness of nature and the historical process? What do current historians see as the relationship among historical consciousness, public memory, and the historical enterprise. Dr. Turner suggests that these questions have unexpected relevance for the debates over climate change and some recent political events. “The discovery of things like geo-dating fundamentally changed our concept of time and the natural history of our planet. This has had a significant influence on our understanding of climate change,” said Dr. Turner. Dr. Turner retired from UNB’s history department in 2010 after a career teaching the history of science and technology, science studies, and historiographical theory. He has published on the history of universities, on the careers of Hermann von Helmholtz and Ewald Hering and their debates over human vision, and on the molecularization of plant pathology in the 20th century. He continues to serve as chair of the Research Ethics Board at UNB. The Conversations on Time Speaker Series is a three-part interdisciplinary event. Each speaker is invited to lead a dialogue on this topic from an academic perspective. The first Conversation on Time event took place in November, 2016 and was delivered by Dr. Tasneem Husain, a theoretical physicist, writer and educator. She explored how scientists and science fiction writes address the concept of time and how their approaches differ. Dr. Turner’s installment is titled History, Process, and Change: Three Questions about Time and will be presented on Jan. 31, at 7:30 p.m. in the Alumni Lounge, Alumni Memorial Building, on the UNB Fredericton Campus. The third talk in the series will be held on March 21, 2017. Dr. Ellen Rose, of UNB’s faculty of education, will address how moments of slowness and stillness are increasingly difficult to find in a world of multitasking and how deep thought requires deep time. The Conversations on Time Speaker Series is being presented by UNB faculties of arts and education. All three events are free of charge and the public is invited to attend.